Greek tragedy, created in the city-state of Athens in the last thirty years of the sixth century B.C.E., is the earliest kind of European drama. Its subject matter is normally drawn from mythology, except that for the ancient Greeks "mythology" was a kind of historical saga, often perfectly credible oral history, including stories about gods and other supernatural beings, handed down from generation to generation by word of mouth. Because history raised to the sphere of legend only remembers milestones crucial to the life of the community, sometimes contemporary events viewed as critical for the survival of a people could provide the material for a tragedy. The Persians of Aeschylus, describing the invasion of Athens by a huge Persian fleet in 480 and its defeat in the naval battle of Salamis, is such a play. However, tragedy is, strictly speaking, neither historical nor mythological; it is a poetic drama in the sense that poetry rises above the particulars of history and expresses human truths of a universal kind. This is achieved by a combination of heroic characters (rising above the ordinary in terms of social status, moral qualities, and intensity of emotions) and plots illustrating the impotence of humans in regard to divine powers. Greek gods did not profess to love humanity, promised no salvation after death, and administered a harsh justice not only to sinners but also to unsuspecting innocents because of crimes perpetrated by their forebears. Tragic characters often suffer and die for crimes they committed unwittingly, or because they were ordered to do so by a god (something possible in the context of Greek polytheism), or because they have to expiate an old sin, or fall under a family curse. When they fully realize the inevitability of their destiny, they act with dignity in accordance with their principles and proceed to do what they believe is right, often precipitating their dreadful end. This is considered a "tragic death," although in modern languages the word tragedy is often used more loosely as a synonym for disaster —particularly a seemingly undeserved disaster that strikes unexpectedly powerful people and happy families. The term tragedy means the song of tragôidoi and tragôidoi means "he-goat singers." Scholars do not know what may have been the relationship of goats to early tragedy, but possible explanations include (1) a goat was offered as a prize in a competition of predramatic choruses, or (2) the members of such choruses were disguised as half-animal demons in the service of Dionysus (such as satyrs) and used goat skins for that purpose. According to Aristotle ( Poetics, ch. 4), tragedy originated from the improvisations of the exarchontes (song leaders) of the dithyramb, while comedy originated with the leaders of the "phallic songs." A dithyramb was a religious hymn in honor of Dionysus, and the Dionysiac origin of tragedy was in antiquity taken for granted, Dionysus being the god of theater as much as the god of wine, vegetation, and fertility. However, tragedy lost its Dionysiac associations very early, and only one of the preserved plays, indeed the very last tragedy of Euripides, Bacchae, has a Dionysiac content, namely the myth of resistance to the introduction of Dionysus's cult to Thebes, and the god's devastating revenge upon the city. Dithyramb, too, gradually lost its religious connection to Dionysus and developed into choral poetry that drew its subjects from mythology (like tragedy). Dithyrambs were also regularly performed in the Dionysiac festivals. It is impossible to reconstruct with any certainty the stages of evolution from religious hymn to ritual enactment, and finally to a kind of secular play in which a great variety of myths were presented in dramatic form to a theatrical audience rather than a group of worshipers. The critical stage in this line of development was the transition from ritual to theater. Ritual must be repeated more or less exactly if it is to be a religious act. But once it metamorphoses into a playful act, its religious ties are loosened and a great potential for development in form and content becomes available to creative artists. The first poet credited with the invention of tragedy was a minor, if semi-legendary, figure by the name of Thespis. His activity is dated to the 530s, although the introduction of tragic productions in the form of dramatic contests to the City Dionysia (c. 505) apparently did not take place before the establishment of democracy. Except for half a dozen titles of plays, nothing survives from his poetry. Sophocles' Antigone, which dates to fifth-century B.C.E. Athens, contains themes that make its production still popular in the twenty-first century. compose serious poetry now turned to tragedy, and epic poets were thus succeeded by tragedians. What made these developments possible and greatly accelerated them was the establishment of democracy in Athens right after 510. A large open-air theater on the south slope of the Acropolis accommodated a massive audience, consisting of the whole population of the city (including foreigners and slaves). 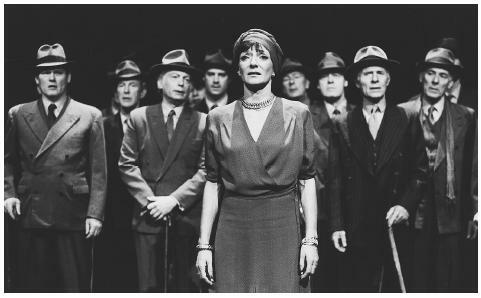 In view of the size of this audience, and the participation of common men in it—the same citizens who voted for new laws and major political decisions in the assembly of (direct) democracy, and also served as jurors in the courts of law—it is hardly surprising that the chorus became an indispensable part of the dramatic performance. The chorus represented and spoke for a collective dramatic character at the level of myth (anonymous citizens, womenfolk, elders, sailors, slaves, and even minor divinities) who in the epic had remained speechless in the background of the action. Further, the dramatists gave new accounts and interpretations of the traditional stories they represented and re-enacted. By doing so, they gratified the contemporary Athenian audience that had made such great political progress from the time of a harsh oligarchy and widespread serfdom in the sixth century to democracy at the turn of the century, which was further consolidated by the victories in the Persian wars. The function of the poet, according to Aristotle, is to state the universal, "to tell, not what has happened, but what would have happened according to probability or necessity" ( Poetics, ch. 9). But what is probable or necessary (outside of the domain of science) depends on what the audience is ready to accept. Was it necessary for Agamemnon to sacrifice his daughter, Iphigenia, in order to be allowed by goddess Artemis to set sail for Troy? Was he killed upon his return home by his wife because he had killed Iphigenia, or because he had destroyed the temples of gods in the sack of Troy, or because his wife had taken a lover whose father had cursed Agamemnon's father? Was there a pattern of divine justice in these acts of revenge? What made the discussion of these questions in public possible and indeed vital was that the Greeks had no religious book, like the Bible or the Koran, to explain the ways of the gods to them, and the level of the morality of gods, as depicted by the epic poetry of Homer and Hesiod (c. 750–700), was hardly superior to that of men. Men seemed and felt helpless in relation to gods—and likely to incur their envy or wrath—yet they thought that even the gods were subordinate to destiny. They dimly hoped that there was a world order contingent on divine providence that had been achieved by the harsh rule of Zeus. In reality men had done a lot better than the gods in pursuing social justice, and even oligarchic states like Sparta had developed constitutional forms of government and law administration already in the Archaic period (admired by later philosophers such as Plato). In representing the human life of the past, the earliest of the great dramatists, Aeschylus, tried to make sense of the inconsistencies of mythology and arbitrariness of gods in relation to the perception of moral responsibility and justice current in Athenian political and judicial assemblies. He wrote trilogies of interrelated plays extending over successive generations of gods and men, and searched for reason and a just resolution of conflicts. Characteristic examples of his work are the Prometheus trilogy Oresteia. Prometheus Bound, the first and only surviving play of the former trilogy, depicts the punishment of Titan Prometheus by Zeus for stealing the fire from gods and giving it to humankind, along with many arts. Aeschylus made Prometheus the son of Themis (Custom, Law), and ended the trilogy with a reconciliation of Zeus and Prometheus, the benefactor of humankind. The Oresteia (the only surviving trilogy) deals with the bloody saga of the Atreids, which is resolved in the Athenian law-court, the Areopagus, by a jury of men who listen to divine litigants (the Furies) and witnesses (Apollo), and vote for acquitting Orestes, though not without the additional vote of Athena, the patron-goddess of the city. Aeschylus dominated the theater in the first half of the fifth century (produced the Oresteia in 458, died in 456). Only seven of his plays, out of approximately ninety written, have survived. Sophocles (497–406 B.C.E. ), although a deeply religious man, gave up trilogies of interconnected plays and the effort to untangle religious issues, and focused on human characters, their motivation, their morality, and the uncompromising dignity with which they faced up to their predicaments. He perfected the art form in terms of plot construction and characterization, increased the number of speaking characters in a scene from two to three, and added painted scenery to the stage. Aristotle considers his Oedipus the King the perfect example of tragic composition, as it illustrates very well his concept of "tragic error" (a crime unwittingly committed, yet affecting family and city like a plague), and the sudden fall of a powerful man from happiness to disaster. However, Oedipus is neither a paragon of virtue nor immoral. The spectacle of a virtuous person suffering unjustly would be abhorrent, Aristotle writes, as the punishment of an immoral character would be pleasing to the spectator and thus untragic. Like Oedipus, the proper tragic hero should be of average moral stature: The downfall of such a person is felt to be tragic and stirs up the emotions of pity and fear in the audience. Sophocles reportedly wrote 120 plays, but only seven have survived, including Antigone, Electra, and Oedipus at Colonus. Euripides (486–406) is the last of the great tragedians of the fifth century. If Sophocles represents the spirit and style of the Golden Age of Athens (480–430), Euripides (who as a young man had been a disciple of the physical philosopher Anaxagoras and the sophist Protagoras, an agnostic) belongs to the troubled period of the Peloponnesian War, which took place between Athens and Sparta between 431 and 404 B.C.E. He made no effort to account for the interference of gods in the life of humans; on the contrary, by having events that preceded and followed the action proper of the play merely reported or revealed in a prologue and an epilogue, spoken by a god (the deus ex machina ), he seems to expose rather than explain the arbitrariness and cruelty of gods, which had made Socrates reject the validity of traditional myths and Plato pronounce epic and tragic poetry unacceptable to his ideal republic. He was less successful than either of his predecessors in his lifetime, but a lot more popular after his death. His plays were revived throughout the Greco-Roman antiquity, and no less than eighteen of his tragedies have been preserved into modern times. Although some of his plays have a happy ending (e.g., Helen, Ion, and Iphigenia in Tauris ) and are considered melodramas rather than tragedies, others depict the human ineffectiveness to avert the fall from a state of happiness to that of absolute misery and disaster. In fact, Aristotle calls Euripides "the most tragic of the poets" ( Poetics, 13). Scholars consider Medea, Hippolytus, Trojan Women, and his last play, Bacchae, his greatest masterpieces. Although one would not have guessed it by reading Aristotle's analysis of tragedy as a poetic genre, the Poetics (c. 330), tragedy declined after the death of Sophocles and Euripides, and the humiliation of Athens at the end of the Peloponnesian War. Although several names (and some fragments) of poets who lived in the fourth century and in the Hellenistic era are known to modern-day scholars, intellectual and political developments, as well as the changing attitudes toward old gods and traditional religion, did not favor the kind of interpretation of the human past offered by tragedy. A new kind of drama, "New Comedy," inherited Euripides' realistic (comparatively speaking) style and Aristophanes' preoccupation with contemporary life and social climate, and became the most important dramatic form in the later fourth and the following centuries. However, tragedy won a different lease on life in the same period, initially as an Athenian cultural export. Several theaters were built in many cities in the fourth century, including the greatest of Greek theaters, that of Epidaurus in northern Peloponnese. After Alexander's death in 323, which marks the beginning of the Hellenistic era, a veritable theatrical explosion took place all over the Greek-speaking world. Every city in Greece, Asia Minor, Syria, Egypt, and South Italy and Sicily established its own dramatic festival, and theater artists set up professional unions (in Athens, Peloponnese, Asia Minor, Egypt, and South Italy) in order to respond and profit from the new tremendous demand for their services. Dramatic festivals and contests became the mark of Hellenic culture, but despite all this activity the conditions for the creation of significant new tragedies did not exist anymore. Old religion had retreated under pressure from new oriental gods. Traditional Greek mythology had lost its value as oral history of the past, and Chance (personified as a goddess) had largely replaced Fate in the mind of ordinary people. Tragedy died out when the Eastern Roman Empire was Christianized in the fourth century. Tragedy began to be revived on a modest scale in the Renaissance, and fertilized modern serious theater and the creation of the opera, which was conceived as a modern form of tragedy, not only in Italy and France, but also later in Germany. Productions of Greek tragedies have increasingly carved a considerable niche in contemporary Western (and Japanese) theater, so much so that one may wonder what it is that ancient tragedy has to say to modern audiences that have no familiarity with or belief in Greek mythology and religion. It seems that the basic shape of the stories, the examples of heroic defiance, and above all the uncompromising dignity with which tragic characters accept the predicament imposed on them by superior powers which they cannot overcome or avoid, hold a universal message of humanity that is as valuable for modern men and women as it was for ancient ones. Barlow, Shirley A. The Imagery of Euripides: A Study in the Dramatic Use of Pictorial Language. Bristol, Eng. : Bristol Classical Press, 1987. Burian, Peter, ed. Directions in Euripidean Criticism: A Collection of Essays. Durham, NC: Duke University Press, 1985. Conacher, D. J. Euripides and the Sophists: Some Dramatic Treatments of Philosophical Ideas. London: Duckworth, 1998. Easterling, P. E. E., ed. The Cambridge Companion to Greek Tragedy. New York: Cambridge University Press, 1997. Easterling, P. E. E., and B. M. W. Knox, eds. The Cambridge History of Classical Literature, Vol. 1, Pt. 2.: The Greek Drama. Cambridge: Cambridge University Press, 1991. Grene, David, and Richard Lattimore, eds. The Complete Greek Tragedies. 5 vols. Chicago: University of Chicago Press, 1992. Kitto, H. D. F. Greek Tragedy: A Literary Study. London: Methuen, 1968. Knox, B. M. W. The Heroic Temper. Studies in Sophoclean Tragedy. Berkeley: University of California Press, 1983. Knox, B. M. W. Word and Action: Essays on Ancient Theater. Baltimore, MD: Johns Hopkins University Press, 1979. Lattimore, Richmond A. Story Patterns in Greek Tragedy. Ann Arbor: University of Michigan Press, 1969. Lesky, Albin. Greek Tragic Poetry, translated by Matthew Dillon. New Haven, CT: Yale University Press, 1983. Meier, Christian. The Political Art of Greek Tragedy, translated by Andrew Webber. Baltimore, MD: Johns Hopkins University Press, 1992. Segal, Charles. Interpreting Greek Tragedy: Myth, Poetry, Text. Ithaca, NY: Cornell University Press, 1986. Segal, Erich, ed. Oxford Readings in Greek Tragedy. Oxford: Oxford University Press, 1983. Sifakis, G. M. Aristotle On the Function of Tragic Poetry. Herakleion, Greece: Crete University Press, 2001. Silk, M. S., ed. Tragedy and the Tragic: Greek Theatre and Beyond. Oxford: Oxford University Press, 1996. Taplin, Oliver. Greek Tragedy in Action. London: Routledge, 1993. Vernant, Jean-Pierre, and Pierre Vidal-Naquet. Myth and Tragedy in Ancient Greece, translated by Janet Lloyd. New York: Zone Books, 1900. Winnington-Ingram, R. P. Studies in Aeschylus. New York: Cambridge University Press, 1983. Winnington-Ingram, R. P. Sophocles, An Interpretation. New York: Cambridge University Press, 1980. Hello. I'm a student at Centennial Secondary School in Welland Ontario. I was doing a project on Greek Tragedy and this web site was the best I found, thank you! I love the web site! It was very informational and had everything I needed! I could use some information though on a play. any suggestions?